This installment of UIBA (don't ask us how it's pronounced) is not about how well a system can be used but whether its design encourages its use at all. And our material is not hypothetical in any form... the "before" is LendingTree.com and the "after" is E-Loan.com. Usually, by the time a review like this is written, the sites in question have changed, so don't be surprised if the sites bear no resemblance to our examples. Perhaps, the changes you see will confirm our judgements. Or maybe we're dead wrong... you decide. When investigating a mortgage, we went to two prominently advertised sites. Lending Tree, below, asks the customer to complete a "simple four-step procedure" before even showing any loan rates. It turns out to be a lengthy series of panels to actually begin a loan application, not just investigate rates! Notice on the next page, the information started getting personal. That's when we bailed, before we even got to the final step. 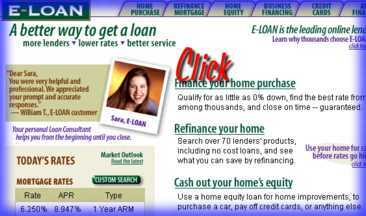 As if rebuilt by a web commerce Albert Einstein, E-Loan, below, offers the web at its best. Click on a link, put in a few items to describe the loan you're looking for and it does the rest. Below, it presents a brilliant snapshot of the best loan rates in every structure, and lays it at your feet... fully-cross-linked, backed by details and a glossary, and enabled with near-spreadsheet power for scenario twisting. If you're compelled by "good code" you'll be hooked right away. The moral of the story? Don't make users jump through hoops before giving them the real payoff of the web--- rich information. Base your product offering on that information and you've got it made. That's the whole story. We're available to help you apply these rules to your system, whether it's a web site, client-server, or embedded application. Just e-mail us.